We were really excited to get a big box of Lakonia Greek Products. Lakonia products are made right here in the good 'ol USA, in the beautiful state of Maine. The owner imports olives from her OWN vineyard in Greece. How cool is that. Our team sampled a few of the dressings, but our favorite by far was the Balsamic Vinaigrette. We felt it was a perfect combination of tang and oil, great for salads or cooking. 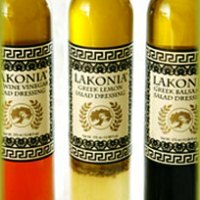 We are sure you will love this dressing, lovingly hand crafted by the people at Lakonia.